Durney Key is one of those island paradises that can be enjoyed by all, but seems to be claimed by no none. According to a sign on the small island, it is owned by the State of Florida - but it is not an official park or recreation area. The only way to get here - about a mile off the coast - is by kayak or boat. Durney Key gets its name from John Durney, who was mayor of Port Richey from 1967 to 1975, and also mayor of New Port Richey from 1978 to 1980. During his terms as mayor, he was a strong advocate for dredging of the boat channel from the Pithlachascotee River into the Gulf of Mexico. When that was finally done, Durney Key was created as a spoil area, and was named after Mayor Durney. 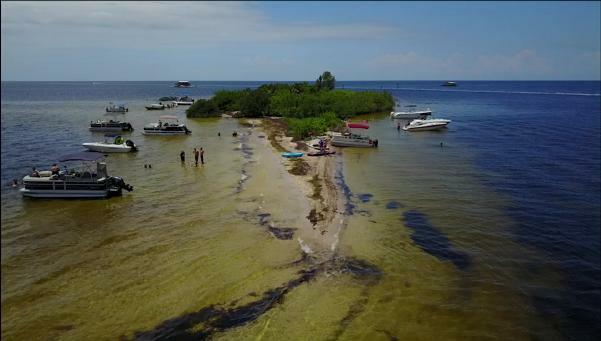 Since Durney Key is not a designated park or preserve, it tends to be somewhat of a no man's land with regard to recreation. You can bring a tent and camp on the island - no permit or permission is required. Shaded tent sites are available, but come early if you intend to camp on a weekend. There is no prohibition against alcoholic beverages, dogs, or anything else you can legally enjoy. The island is surrounded by shallow water suitable for swimming, snorkeling, or scuba diving. And there is a nice white sand beach along the Gulf side. Water is generally clear and the bottom is firm. The "Quick Tour" video above was taken during an extra-high tide ... normally the beach extends much further away from the shore. Located to the north and south of Durney Key are stilt houses built in the Gulf of Mexico. Originally built beginning in the early 1900's, there used to be more than the nine that remain today. All the houses are privately owned. It's fun to paddle or snorkel to the closest houses and have a look around. But climbing onto the houses is not allowed. If you're coming to Durney Key, you'll need a watercraft. The closest - and probably most convenient - place to launch a canoe or kayak is Port Richey's Brasher Park, at the west end of Koons Road. You can also launch or rent a kayak at Werner-Boyce Salt Springs State Park, located off US19. Motorboats can be launched from a number of places from Hudson Beach to Port Richey.